Allochol works as a bile-expelling agent decreases the processes of putrefaction and fermentation in the processes of putrefaction and fermentation in the intestines. 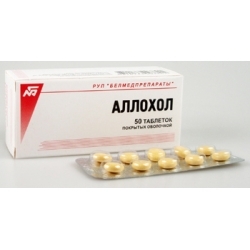 It improves the secretion functions of the liver cells, and the motor activity of the digestive tract organs. Use in cases of chronic reactive hepatitis, inflammation of the bile duct, gallbladder, indigestion in the bile tracts, and constipation. 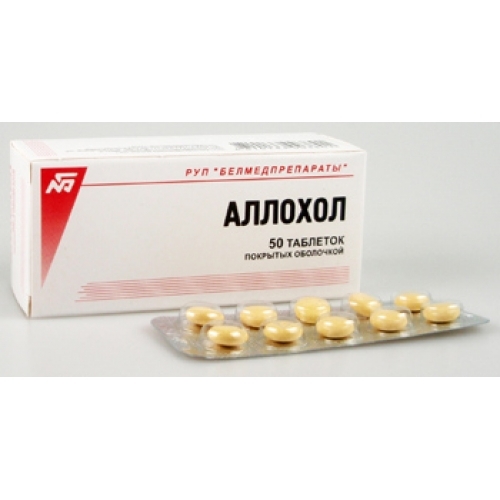 Do not use in cases of hypersensitivity, obstructive jaundice, acute hepatitis, acute and mild dystrophy of the liver, ulcers of the stomach and the upper small intestines (duodenum), and acute infection of the pancreas. Recommended dosage: Take 1 to 2 tablets 3 to 4 times daily after meals for 3 to 4 weeks. In cases of acute condition take 1 tablet 2 to 3 times daily during 1 to 2 months. Repeat course of treatment should be performed after an interval of 3 months. Side effects include diarrhea and allergic reactions.